This past week my wife and I moved our youngest of four children to college – totally fun and a momentous occasion for the three of us, and the family as a whole. And it was an awkward, even painful learning moment for me in how easy it is for men to assume positional authority and ignore better input from women. In this case, we were moving our son into a college outside New York, and wisely chose to fly there instead of doing the 14+ hour drive (which we have done one too many times with one of his older brothers and older sister). We landed at JFK and I picked up a rental car and headed to campus. I grew up in California and am definitely a product of that state’s car culture – I don’t mind driving at all, I kind of like it. And having spent 10 years living in Boston, I also have gotten completely comfortable in driving amidst the aggressive chaos that is northeast urban auto jostling. I now travel with a phone case that plugs into the dashboard, so am good about getting our coordinates in Google and letting that take the load of getting us from starting point to destination. Early on Google had a disclaimer on their directions that said something like “do a reality check before following these instructions” and that is precisely where I ran afoul of getting us from where we started to where we needed to go. My wife on the other hand is confidently old school. When we travel the first thing she grabs is a printed map. She is as awesome at orienting herself with a map as she is adept at using it to explore and get to the destination. We’ve taken some wonderful vacations where her annotated and highlighted paper map of where we went and what we explored is such a rich record of time well spent. What made this drop off at college different from the other three is that my wife and son had been to the campus earlier in the year and spent a fair amount of time exploring it and getting to know it. And there was me with Google and at the wheel of the car striving to get us to where we needed to go from Google’s perspective. And that’s where the humbling learning moment for me started to take its slow motion trajectory. As we got closer to the campus I was following Google and my wife was following her experience and astute sense of memory and direction. As we got to the campus I was trying to find what Google was telling me to look for, and my wife was telling me what she knew from experience and her sense of direction. I effectively ignored her until it was too late. And I can try and explain why “ignore” was not really ignore, but this is where it doesn’t matter what I feel or think, but what she does, because she is on the receiving end. The analogy I will use here is as spot-on as it is uncomfortable. If a woman feels she has been harassed, it really doesn’t matter what the harasser feels or how they interpret the circumstances. The sole “owner” of that perspective is the one on the receiving end. But what ended up happening was a fairly tense exchange that shut us both down in the moment. Her lingering frustration later caused her to have to speak up and effectively justify why she should have been listened to and considered. And me trying to justify my behavior around being focused on getting to the “destination.” – which in hindsight is ridiculous. From her perspective she was put in the position of (a) having better information and (b) having her better information ignored and dismissed. Sound familiar women? But at the time I had both position (I was the driver) and authority (google maps) – and we were conditioned that when we drove places it was my position and authority that made the final decisions. Nothing malicious here, but over time, it put me in the position of being the decider. And in this case, I sure was deciding. And my wife was sure feeling not listened to or considered. At the time neither of us realized any of this. We both just shut down and simmered. Until we found the right parking lot, and our attention conveniently shifted to this wonderful day and our son’s new adventure at college. We avoided the fact that if I had been listening to her we would have been where we were supposed to be sooner, with less stress, and more focus on our son’s first day at college – which for she, me, and him was such a wonderful, wonderful moment to savor. It wasn’t until much later that night, after we had flown back home and were on our way (with me driving) from the airport to our house. It was then my wife brought up the whole experience. And it was through the process of unpacking the issue that we both reached a point where we able to focus on how each of us felt, which is where the real conversation happened. We talked about how we became conditioned to me being the driver over time and that there were a few ways to address this. One might be her driving more when we are together, especially when she knows the terrain more. Which is a good alternative, but to me feels a bit “brute force.” Switching the position and the authority. To me the real solution is creating the conditions where I listened to hear and she could feel heard. That’s the harder solution. I take women’s equality seriously. Yet here I was, repeating a pattern of male behavior and causing my wife to repeat a pattern of feeling ignored or dismissed. It was pretty easy to respond so unthinkingly – isn’t that the opposite of thoughtfully? And it made me consider how hard it is to create the conditions where these kind of conversations can take place. In most workplaces women don’t get that safe place to share their thoughts like this and be vulnerable. They just learn to deal with being dismissed and not heard. We have to be able to do better than this. Because in those moments, the focus needs to be on how to get to the destination as efficiently as we can – whether a marketing campaign or an algorithm – and savor the moment of why we are all together, working on a common goal. I’ve certainly been aware of mansplaining and am generally sensitive to it. But I have seen it happen less than I have had women remark on it. And they remark on it with a sincerity and authenticity that is breathtaking. It was on a recent business trip when I experienced this myself, first hand. I was traveling with a woman who is on one of my teams, and we were visiting some of our sales regions to review our marketing plans and priorities to get feedback and engagement. One of those invaluable investments of time that ensure we develop campaigns that are relevant and have impact. And before I go further, the story I am about to tell involves really talented, experienced, and caring people – we have an awesome culture and that’s one of the many reasons I love being here. But that is also the point. Even with talented people in a great culture, this can happen. At the first meeting we had a handful of sales reps in the room, and before I’d even gotten to the overview of our plans one of the reps spent literally ten minutes explaining how demand generation worked. Ten minutes. How his prior company did it. The concept of a buyer’s journey. The need to ensure you have marketing plans directed all the way through from the top of the funnel to the sale. But it was ten minutes. Of him explaining to me what I’ve been doing for more than 20 years. And I’m really good at marketing. A two-time CMO. The first CMO at my current company. But he explained it all to me. When the meeting ended, my female colleague and I shared a laugh about it all. To me, it felt like a single occurrence. No way, really? Is that how you do that? 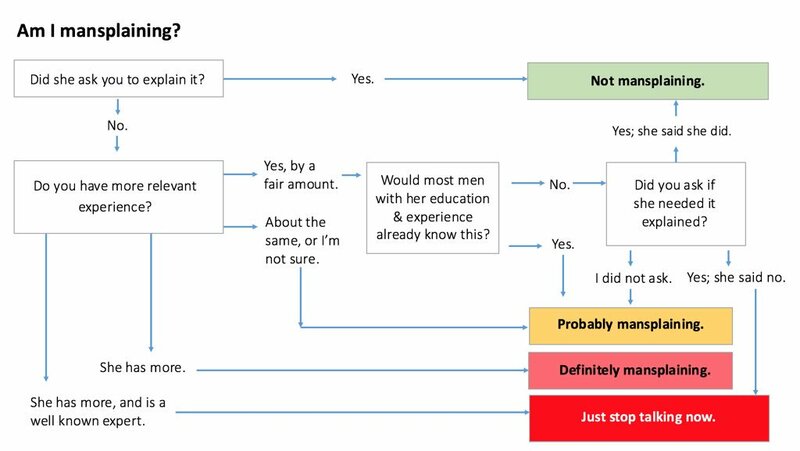 So when I saw the awesome tweet featuring an “Am I mansplaining” flowchart from Kim Goodwin I felt like I understood this a bit better. Men, study that flowchart. Commit it to memory. But what really happened in my exchanged with these talented salespeople here was a series of missed opportunities. By leading with explaining and not questions, it both annoyed me and focused my attention on being explained to, and not on exploring what we could all be doing together to ensure our marketing had the greatest impact possible. And when you consider that what happened to me were isolated instances on this trip and that it happens to women systemically – the greater issue is how much opportunity is unexplored when men talk over women, when men lead by explaining and not by asking questions. We lose all lose as a culture by letting mansplaining persist, but women bear the professional and personal consequences of confronting it every day, of having their ideas ignored or talked over. As I have posted before, men just glide through life feeling little if any of what women feel every day — encountering obstacles, biases, and mansplaining and being talked over. On this business trip, I visited this landscape but so easily could return to my male-centric journey through my career. Women are not so fortunate. Men can help here. When you have that urge to explain, ask a question. I wasn’t all that that creative. Steve Jobs made this point in his Stanford Commencement speech in 2011, six years before he died. His point was that a career path is only visible in hindsight. The “path” is produced by following your interests and talents. But I want to take that a step further. My observation is that your career is a product of the relationships you develop along the way in your job along with following your interests and your talents. Notice I didn’t say college alumni networks. One of the points I made to the UWW students was I attended two of the top five universities in the world (Berkeley and MIT), and my alumni networks have produced zero jobs for me. But the relationships I developed at LSI Logic, at C-Cube Microsystems, at RealNetworks, and as a venture capitalist at Frazier Technology Ventures have produced six incredible jobs, and have formed the foundation of my career. When you unpack “relationships” there’s a lot to examine. For me, relationships are formed by establishing trust and credibility with the people you work with and for. And you do that by doing what you said you would do. By speaking your mind. By being honest. By acting with integrity. By being in a culture that aligns with your values. Your network of relationships is fundamentally about about your personal brand. That’s right, your personal brand is made up of the people you work with. How well you communicate to them. How well you support others. And that all involves . How you treat them. Those experiences, those memories persist. They’re your personal brand. And here I am, at another juncture where I am about to move to my next adventure. I left my role as CMO at SPS Commerce in early January, to return to Seattle. Family reasons draw us there, and I really wanted to get back to my roots – building category-creating technology companies. And it’s this network of relationships that is guiding me. Which made me think of another set of conversations I’ve been having with folks I know – about how instrumental these relationships are to discovering your next adventure. Hone your story – What this means is having clarity about what it is you want to do and what you’ve done to prepare you for this, and it’s being sober and humble about what you’re really good at. And finally, it’s about being compelling about why this next adventure is right for the role and for you – and for whoever it is you will work for. “Your story” is what you say after you meet someone, you exchange pleasantries, and there’s a pause. You then tell the story. Why you’re there with them, why there is context, and you paint a picture of your future that they might be able to help you with. Lots of conversations – This is the foundation of the process. This is where you start speaking to lots of people who might be able to help sharpen your focus, sharpen your story (you’ll be telling that to them), and who might know someone else who you might meet. But fundamentally you are asking someone to spend time with you. To help you. It’s awesome your contact will meet with you, so be considerate of their time. Thank them. And make sure you see if there’s anything you can do to help them. It will make you feel less bashful about asking for feedback, or to be connected to someone else. Considerate networking – Expect and insist on “double opt-in introductions” – this means the person connecting you someone needs to check with that person to confirm they’re interested BEFORE making the introduction . Only after that person agrees to be introduced, then expect the introduction. This means there’s mutual interest in the conversation. This also introduces an obligation to responsiveness on your part. That means as soon as you see that email connecting you to the other party, respond promptly – before the other party has to. Your contact is doing you a favor, so demonstrate grace by making it easy for them for them to find a time and place to meet. And while you’re at it, be considerate of the person who made the introduction. In your reply, move that person to the bcc line of the email. That way they will see that the connection has been made, but they are not burdened with seeing the 7+ email exchanges that went into finding a date and place to meet. Let go of the outcome – This is the hardest part. The only part of this process you can control is your ability to meet with people, tell your story, and explore where this all takes you. What it won’t do is provide a linear path to an awesome next role for you. But enough of these sincere conversations, where you’ve been considerate and forthcoming, will produce a conversation, at some point, that will point to a person or a role, that is exactly what you’re looking for. It’s that simple. I can tell you every one of the awesome opportunities I am exploring right now have followed these four steps. And it has had nothing to do with where I went to school. And like with you career – there is no deterministic path you can see stretching forward. Just a network of relationships guiding you down the road. Recently, my world has been totally rocked with the multi-player game “7 Days to Die” which is a zombie apocalypse game that my children and I play together, even when scattered across the country. Sunday at 7 is our time, and we generally play with me in one city, each of our kids in other cities, and some of their friends in other cities as well. 7DTD is a game where every seven nights (in game) a zombie horde attacks, and the rhythm of the game is to spend your time between hordes preparing. It’s all about cooperating, and dividing up the work – where the work can be scavenging supplies, making building materials and tools, crafting weapons and ammunition. And developing a plan to defend ourselves. We all log on, and setup a group phone call, and there’s a constant stream of updates, suggestions, and help. Here’s the base we’ve created. My main skill is converting rocks and sand into concrete. You can see how we put that to use. BTW, this base was shredded later that night (horde night). We survived, but the base took tremendous damage. Which caused us to assess what had gone right, wrong, and what our next defense setup would need to look like. We figure out what’s working, what’s not, and adapt. This is what I do at work every day. Except for the zombie horde. At work it’s competitors. It’s an easy way to spend five hours without even realizing it. And it is a rock solid environment to hone the kinds of skills any of us needs to get through life, and succeed in our careers. But every week it’s the same focus. We develop a plan to build defenses, a plan for how we’ll cooperate and support each other because we all have different skills and resources. And like all plans, they become obsolete the moment the zombie horde arrives. Here we are at night, my avatar’s name is RaceCondition (inside computing joke there) and the view is from one of my son’s avatar. We’re all so relaxed because since hordes swarm every seven days, and it’s day 58, we can more easily gather like this at night (in this shot we’re at an abandoned city looting). But before going on, let me tell you about how my children (and their friends) and I got here. It may be that our family is unique, but I really doubt it. Our kids grew up playing video games. Freddi Fish was a big hit when they were little. They played them on the desktop computer we had way back then. But even then the play had a strong social component to it, since we had four kids in five years, there was lots of group play involved. Two or three of our kids would be crowded around the monitor watching the other play, and there’d be banter throughout the game. When the subject of getting a video game console came up, my wife and I proceeded cautiously. We’d “heard” so many scary stories about them. About how people’s kids would disappear for hours/days/weeks into a basement TV room and waste away there, living this solitary existence staring into a screen. What we got wrong about video games is how incredibly social they are. And how much the games foster problem solving and collaboration. We started slowly, with a Nintendo Wii. And it was fun. Mostly family fun. And soon the topic of an Xbox surfaced. Their friends had them, and over time we reluctantly agreed. There we some conditions, the biggest was that the kids would need to pay for it themselves, along with the games they wanted. So they saved, and did. What ended up happening totally surprised us. This was full-on social pandemonium. There’d be upwards of a dozen kids at time in our basement – some playing – but most watching the others play. And the conversations, laughter, and screams of delight that grew and grew as the games progressed could be heard throughout the house. We also witnessed our kids spending so many hours playing with all their friends and spending those hours talking…about the game, about life, about anything and everything. And there’s a growing amount of research showing video game play does create better career skills. Which is why I was so touched when our youngest child, four years ago, suggested I learn to play Halo. He was patient, it took me literally almost a year before I didn’t feel completely incompetent. But we played through Halo 2, then Halo Reach (as far as our children are concerned, the franchise effectively stopped there). Eventually I would even get invited down when all the other friends were there and play with them, and hold my own. I went on from that to play through Portal, Portal 2, and Bioshock Infinite. All three of these are phenomenal problem solving games with awesome story lines. Portal 2 is worth playing just to experience Stephen Merchant as the voice and personality of Wheatley – likely the single best voice performance in a video game, ever.. The more I observed how our kids played these games with their friends the more it looked like the environment I like to foster on my teams at work: goal-focused, team-oriented, sharing data to make better decisions. The more it looked like the environment I strive to live up to in my User Manual. So of the many good decisions my wife and I made as parents, one was being open minded about video games, and trusting our children to make good decisions about how to embrace video games. We learned a lot as a family there, that has helped prepare our children for career success. And it really is an essential component of demand gen. Essential. Let me digress for just a bit. Assume you’re zeroed-in on your category, your demand gen is solid and scaled, and now you’re creating a steady, growing stream of prospects to your sales team. And they’re closing them at a brisk pace. As hard as all that was, now the real work begins. That solution to the problem you promised the prospect? It now needs to be delivered through the product experience. The very first time that new user signs on. I wrote about this in my blog post on conversion optimization of demand generation. That new customer found your product because of how it was marketed to them. The very first time a new customer experiences the product, it has to align with the value proposition your promised. So, how do you know if you’re delivering on that promise? And it’s super important, because customer acquisition is pointless without retention. Jamie Quint explains this exceptionally well in a guest post on Andrew Chen’s blog, and goes further to highlight that retention is the core driver of virality. That means retention is a core driver of your…demand gen. Right. Full circle. First of all, you need to look at each user in the context of a group of users called a “cohort” – usually this starts as the collection of users whose first experience with your product happened during the same timeframe (day or week typically). And you can see how the cohort segments into usage activity patterns – some will be super active, some moderately active, and some not active at all. This can get you started, but doesn’t really tell you a whole lot. You really need to know two other “hard to define” metrics. First – what constitutes a meaningful action for that user in their first session? That means you don’t just need to understand the core functionality of your product, but how that first time user is going to interact with that functionality to get something they consider valuable done. This is exactly where your product team and your marketing team should have a happy collision. Didn’t your marketing start the acquisition process by trying to figure out what the exact words that prospect would use to describe their problem? At the very beginning of the customer journey? Well, now the product team needs to deliver the solution in the form of an experience, in terms that the converted prospect (now customer) will recognize as valuable. To them. Of course it’s not that simple (buyers may not be users, but buyers did buy solutions to problems your marketing team zeroed in on). Second – how frequently will that customer be expected to use your product? You need to know this to establish the baseline of your entire measurement approach. Is it hourly? Daily? Weekly? You may think you know when you’re developing the product, but product design is focused on personas and assumptions about usage. Now you’ll need to check those assumptions through cohort-based analysis of real world people. Amplitude has a great blog post about figuring out how often people use your product. And everything I just described is virtually impossible to measure with Google Analytics. That free tool is awesome for measuring website activity, but is architecturally incapable of measuring cohorts (believe me, my teams have tried, hard and GA is miserable at cohort analysis). There are some really exciting companies filling that void who have designed cohort-based tools specifically for behavioral product analysis. 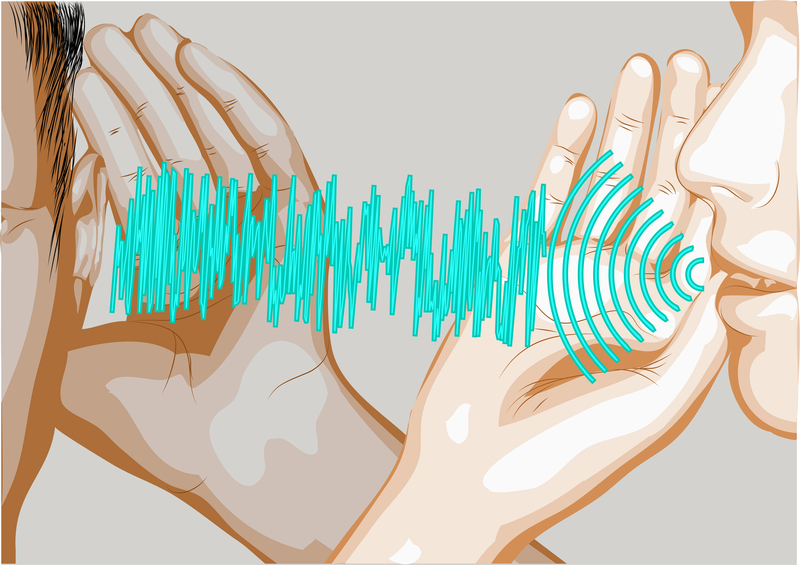 Amplitude is one – who offers a free versions that you can use to instrument your product and get plenty of data, and then of course have much more sophisticated capabilities you pay for. This is where Product owes an obligation to Customer Success to ensure that customers activate, and then the success team can drive long term adoption. So the product team should own understanding what value needs to be delivered in the first two uses of the product. This will take intensive focus on data, cohort behavior, and many, many iterations with the product design and dev teams. Customer Success should be a part of this process because they will need to take those two experiences and ensure they become hundreds or thousands, or more. In my last role the company had gotten to scale without any focus on product usage or product usage measurement. I was fortunate to have a whip-smart product manager who spent an entire year of these weekly meetings getting grounded in the basics, and bringing that cross functional team to have a clear and compelling understanding of what drove the first two experiences. And bringing this back to where I started. Product activation is a critical step in your demand gen strategy. It’s why a lot of CMOs have responsibility for both product and marketing, and if not, it’s why CMOs need to have super tight and trusted relationships with their product colleague.